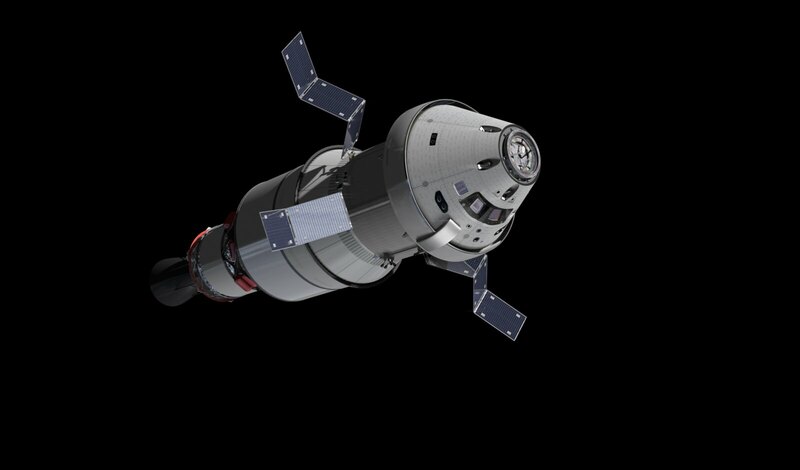 It is time for the Big Cargo Post 5.0 detailling what ATV-5 will be carrying to the International Space Station. Sadly this will be our last Big Cargo Post as this is the last ATV! 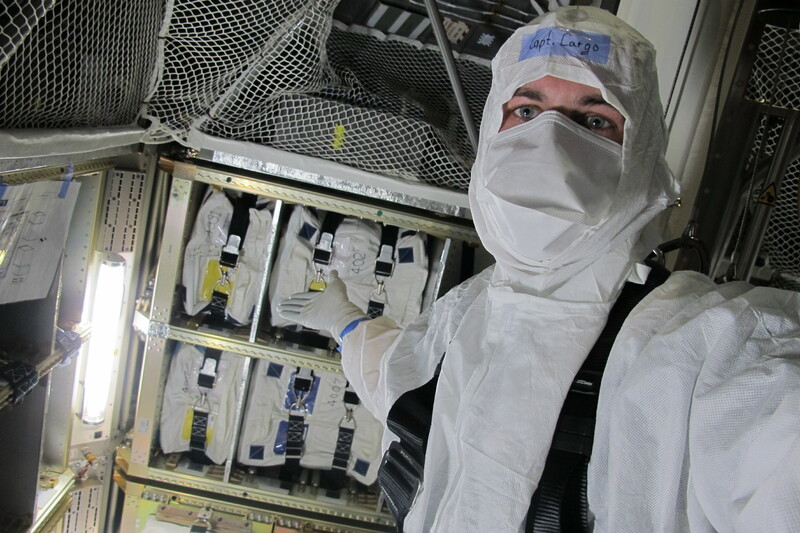 From 30 June to 3 July, teams in Kourou conducted ‘Late Cargo Loading,’ a complex operation to load almost 1234 Kg of ‘late-load’ cargo into ATV Georges Lemaître vertically through the vessel’s hatch. The late load is so called as it comes after the main loading has already taken in Kourou, after the two sections of ATV arrived. On 27 June, ATV-5 was lifted 52m to the top of its massive Ariane 5 rocket in Kourou, and integrated onto the upper stage in its vertical launch orientation. With the vessel’s hatch open, technicians installed the Late cargo Access Means (LCAM) on a bridge spanning the ATV hatch. 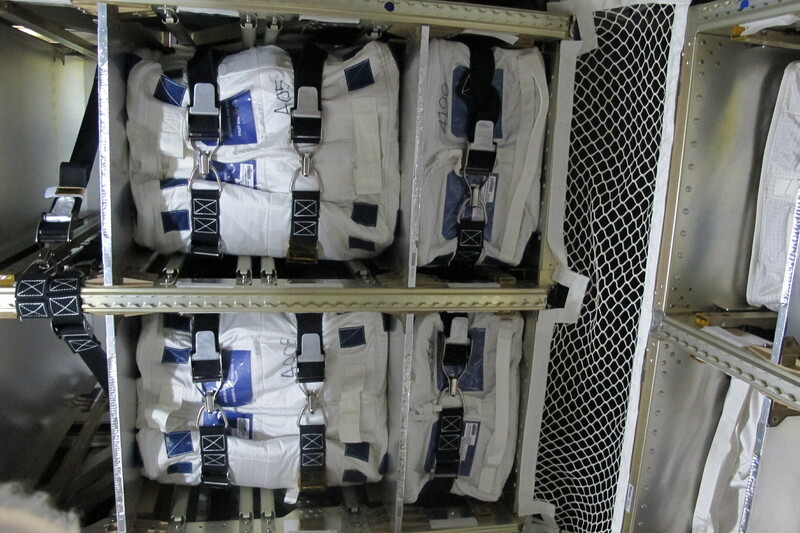 The LCAM is a sophisticated hoist system that allows technicians to access the interior of the Integrated Cargo Carrier (ICC), hoisting on board additional cargo comprising 57 Cargo Transfer Bags (CTB) varying from Half-size to Triple CTBs as well as 5 extra-long “Compressed M-02 bags”. 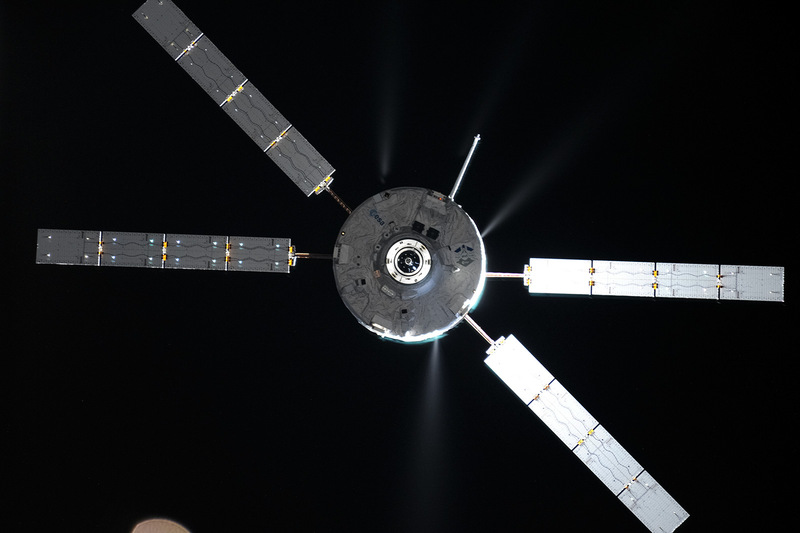 ATV-5 is set to carry almost 6.6 tonnes of supplies to the Station, including a record amount of dry cargo – around 2682 kg. We spoke with ESA’s lead ATV cargo engineer Kirsten MacDonell, who is in Kourou to oversee the delicate process. Can you give us an overview of what ATV is hauling into space? 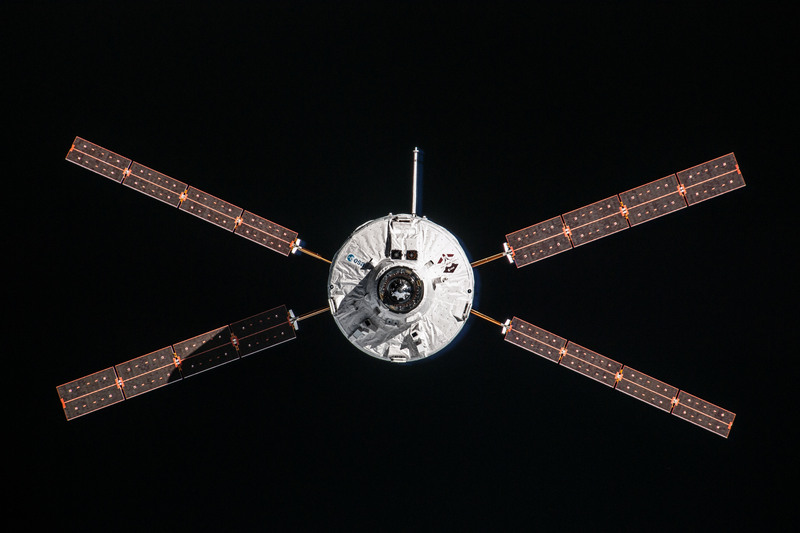 As with previous ATVs, ATV-5 carries food, water, oxygen and research equipment, as well as fuel – to replenish the Station’s tanks, conduct ISS reboost burns and to propel itself during free-flight. Note that ATV-5 is carrying more water and dry cargo in its hold than any previous ATV. Note that for the first time, ATV’s three water tanks are fully loaded. All the dry cargo is packed in Italy prior to shipment to French Guiana. In March, 1448 kg of dry cargo was loaded in Kourou via the Aft Access Closure before the Pressurized Module was mated to the Spacecraft. 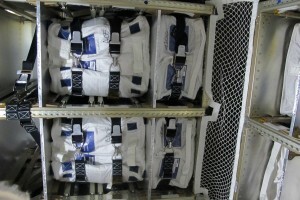 In addition, the fuel, water and gases were loaded in Kourou. What’s left to go into Georges Lemaître now during late loading? 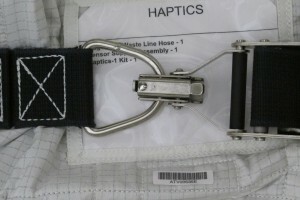 ESA-HAPTICS The kit is a single launch container that contains a force-reflecting mechatronic joystick, a touch-screen tablet PC and some periphery equipment required to execute the HAPTICS-1 and follow-up experiments on the ISS. 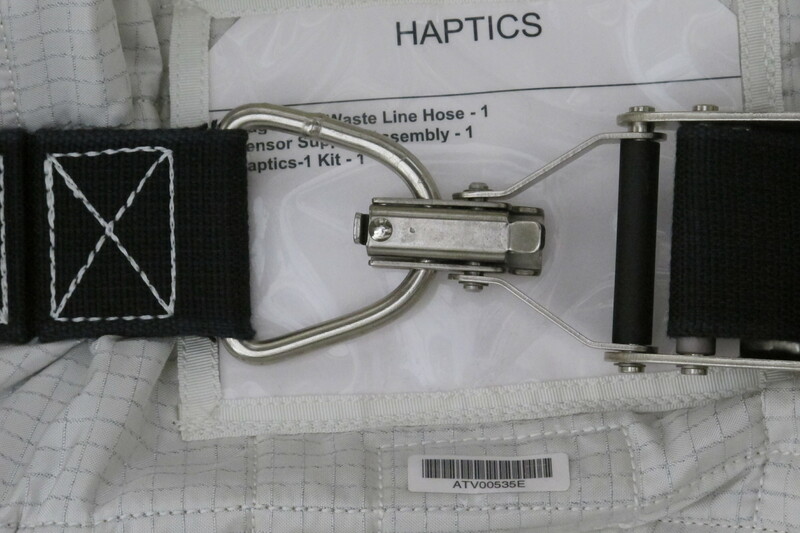 ESA – SPACETEX A space textile experiment that will see astronauts wearing new fabrics during daily sports activities in-flight on the ISS. Garment samples will be returned to ground later for chemical spectrometric analysis; Garment 1 is made of PES, PET and PBT, while Garment 2 is made of cotton. For ESA, there are more, including experiments and experimental supplies for BLB, EPM, ESA ENERGY, ESA AIRWAY MONITORING, MagVector and WISENET. We’e also installing a number of special cargo items, which for me, are terrifically interesting. MSL-EML – the Material Science Laboratory – Electro Magnetic Levitator for ESA’s Columbus module. EML is major! EML is an experiment that uses electromagnetic levitation in a melting facility for container-less processing of metallic samples under an ultraclean, ultrahigh vacuum of high purity, noble-gas atmosphere, which allows studies in material thermodynamics, determination of the physical properties of liquid melt samples. The device itself is a beast, weighing in at about 400 kg and including a power supply/water pump, hi-speed camera, gas supply module and sample chamber. This unit alone outweighs any previous ATV load of ESA scientific cargo, which typically reached only about 300 kg. BUC – Break Up Camera. 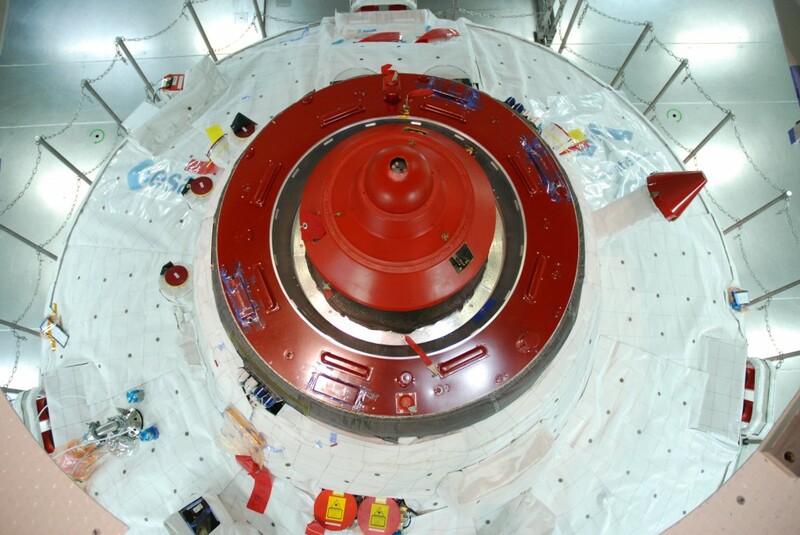 The BUC experiment aims to collect data during the re-entry and destructive demise of ATV-5 in order to further our understanding of the break-up process and provide validation for the models we use to predict break-up. The experiment includes two pieces of hardware: the Infra-Red Camera (IRC) and the Re-entry Satellite communicator (SATCOM). The IRC is switched on by the crew at most 72 hours before undocking whilst the SATCOM does not power up until ATV is breaking up during re-entry.This is one of the three ‘Shallow re-entry experiments’ (REBR-W, I-Ball, BUC) on board ATV, one from the US (REBR-W http://www.aerospace.org/2012/08/21/rebr-probes-the-mystery-of-reentry-forces/), one from JAXA (I-Ball http://www.nasa-usa.de/mission_pages/station/research/experiments/812.html) and one from Europe (BUC). Editor’s note: The last spaccraft in ESA’s family of Automated Transfer Vehicles will contribute to the Space Station’s final moments. Due to the size of the orbital outpost, there is a risk of fragments bouncing back into space off Earth’s atmosphere, much like a flat stone skimming across a pond. Until now, ATVs reentered at a steep angle to reduce the area of collision with Earth’s atmosphere. 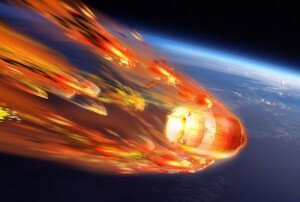 ATV Georges Lemaître will perform a shallow reentry. Three different experiments (designated REBR-W, I-Ball and BUC) will generate precious information about the break-up for future reentries. Look for an article describing BUC in the main ESA website in the coming days. 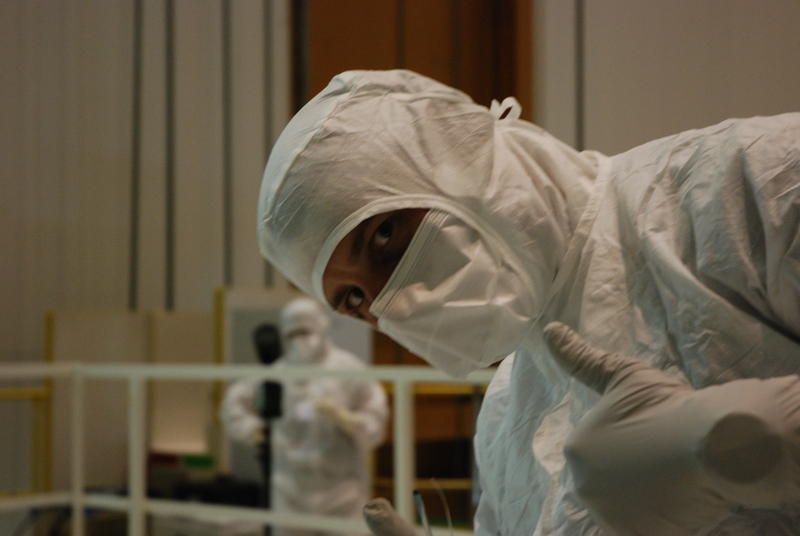 The LIRIS demonstrator (Laser InfraRed Imaging Sensors) will help us develop the ability to conduct an uncooperative rendezvous in space (details via http://www.esa.int/Our_Activities/Human_Spaceflight/ATV/ATV-5_set_to_test_new_rendezvous_sensors — Ed). 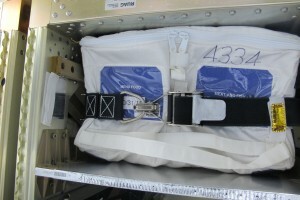 What about cargo for other ISS Partners? 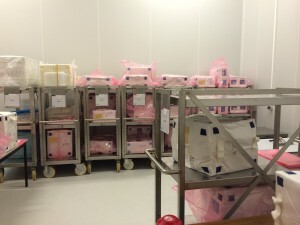 For JAXA, we’re carrying Biological Rhythms, JAXA Zebrafish Muscle and ExHAM. 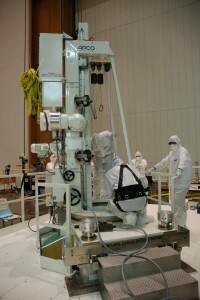 The last one comprises equipment to provide a means of exposing a variety of experiments to the space environment; it will be attached to the Japanese Experiment Module (JEM) Exposed Facility or other portion JEM exterior. Elite-S2 Marker Kit – Body markers and adhesive tape to be used with the ASI instrument Elite S2 on board the ISS. This facility is a body motion analyser, to carry out experiments in the field of human physiology and adaptations to weightlessness. Wetlab – a stowage kit for WETLAB experiment consumables and tools used in sample processing and handling. What is the oddest item ATV is carrying? What was the schedule for late load cargo? All the CTBs and items were disinfected here in Kourou in the weeks of 16 June for NASA cargo and 23 June for ESA cargo. After ATV was lifted to the top of Ariane on 27 June, crews installed the LCAM bridge. The hatch was opened and cargo loading started on 30 June and continued until 3 July. On Thursday, 3 July, we did a final check and then prepared for close-out and hatch closure, which is a detailed process that includes a leak check, air sampling and other procedures. After that, Arianespace can proceed with integrating the aerodynamic fairing, fuelling the rocket and final preps for roll-out to the launch pad.